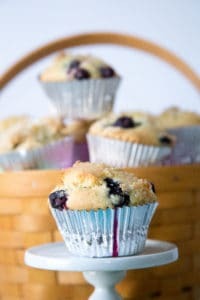 As fluffy, dense and tasty as any you'll find in a bakery, these gluten-free blueberry muffins will ruin you for any boxed mix - or any other muffins. Blueberry muffins. 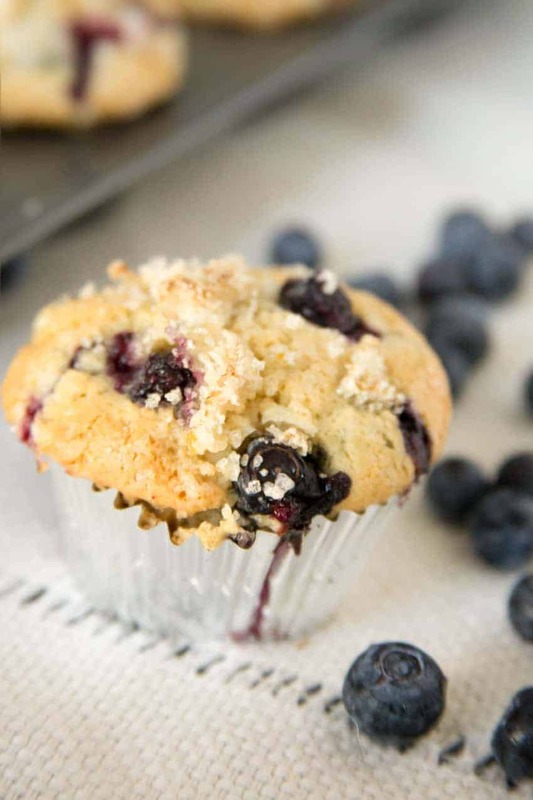 I love them with streusel topping, as mini loafs, and even as a smoothie, as evidenced by the rest of the gluten-free blueberry muffins recipes on my website. But I love these muffins best. 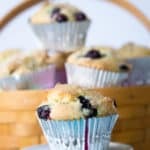 This recipe for gluten-free Blueberry Muffins yields a dozen cakey, dense muffins like the ones you’ll find in gourmet bakeries and coffeehouses. Once you try these, you won’t reach for a boxed mix again. I make these gluten-free blueberry muffins all summer using fresh blueberries. I’ve made them with frozen blueberries too, and the recipe works just as well. I’ve also used a combination of raspberries and blackberries, but I swapped the lemon zest for orange, which was delicious. Measure 1/4 cup of sugar into a small bowl, and add the zest of half the lemon. Stir to combine and set aside. In a medium-sized bowl or in a stand mixer, beat together the butter and remaining sugar until well combined. Add the eggs and mix well. Beat in the baking powder, salt, vanilla and the zest of the rest of the lemon. Then alternate 1 cup flour with ¼ cup milk, beating gently to combine. Scrape bottom and sides of the bowl to make sure ingredients are incorporated. Gently stir 1 ½ cup of blueberries into the batter. Scoop the batter into the prepared muffin pan, filling each well about 2/3 full. Top the muffins with remaining blueberries. Sprinkle 1 teaspoon of the sugar and zest mixture on the top of each muffin. Bake the muffins for 28-30 minutes, until they’re light golden brown on top, and a toothpick inserted into the middle of one of the center muffins comes out clean. Cool in the pan for about 5 minutes, then transfer to a rack to cool completely. This entry was posted in Baked Goods, Dairy Free, Recipes and tagged baked goods, dairy free, G-Free Foodie, gfcf, gfdf, gluten free, gluten free baking, kc cornwell. Bookmark the permalink.